There are many titles that offer rehashed ideas for self-improvement with themes which have been retold hundreds of times. In an era of change marked by a fervent search for self-understanding, volumes of confusing material has accumulated, making it difficult for the earnest seeker to find reliable advise and direction. Sherry has brought together every aspect of the self search process. 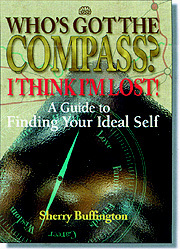 She hands you a compass that virtually ensures you will find your ideal path. The reader friendly, step by step process eliminates confusion and guides dedicated seekers directly to their life's purpose. From this place of purpose, individuals create effective plans for personal and professional success. This book is an essential guide to the most important journey of your lifetime! Sherry Buffington,co-author of the highly acclaimed CORE Multidimensional Awareness Profile, has forged a new path toward self-understanding. Through her own personal experience, and years of working with people as a motivator, life planner, educator, and business consultant, Sherry has provided a realistic approach to finding your ideal self. Sherry currently offices and resides in Dallas, Texas. "Who's Got the Compass? I Think I'm Lost!" is available through NaviCore International for only $16.00 (including shipping). Click here for information about other books and articles.